Nearby Norwegians take a field trip to the new MOHAI Resource Center ... in Georgetown! Part of being a good historian and writer is keeping current with changes in the field. So the Nearby Norwegians felt it important to see, up close and personal, the new location for the Sophie Frye Bass Library, the research facility for Seattle's Museum of History and Industry (MOHAI). Most Seattleites are aware that MOHAI has relocated to Lake Union Park. Saturday December 29, 2012 marked the ribbon-cutting for the beautifully restored Naval Reserve Armory as the new home for this valuable community resource. The massive signage and superb grand opening has been the talk about town. You can watch the Q13 news release here: Q13 News. But did you know that MOHAI also has a second new location!? As Knute Berger from Crosscut.com put it in his January 24, 2013 article titled The Other MOHAI, "...Let's not forget the "other" new MOHAI. Tucked in a non-cool part of Georgetown, south of the Seattle Design Center in the warehouse and showroom ghetto of the Industrial District, is the heart of the museum's behind-the-scenes operation: the "MOHAI Resource Center." Knute "Skip" (Mossback) goes on to say, "But the old Armory building didn't leave much room for the guts of the museum operation, the stuff the public doesn't see: administrative offices, the research library and the expansive collection." In his article, Mossback provided readers with a wonderful insight into the 'expansive collection' side of the new facility. 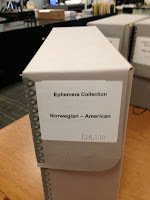 The Nearby Norwegians were curious to see what was new and exciting in the research library - the Sophia Frye Bass Library. According to the MOHAI website, "The museum's Sophie Frye Bass Library preserves and provides access to over 3 million historic photographs, as well as manuscripts and archival holdings, maps, books, posters, motion pictures and printed ephemera. Our collections cover the Seattle metropolitan area, and certain subjects of the rest of Washington State and Alaska. Archival holdings include business and organization records, personal papers, photographers' collections, and historical research documents." Who was Sophia Frye Bass, you might wonder? Sophia Frye Bass (1866-1947), known as "Aunt Opie" to her nieces and nephews, was the third child of George Frederick and Louisa Catherine (Denny) Frye. She married Daniel Waldo Bass on December 14, 1908. Sophia wrote two children's books about early Seattle history: "When Seattle Was A Village," (Seattle: Lowman and Hanford, 1947) and "Pigtail Days in Old Seattle" (Portland: Metropolitan Press, 1937). She died July 28, 1947 and was laid to rest at Lake View Cemetery. She left her valuable collection of rare Northwest books, papers, pamphlets and maps to the Historical Society of Seattle and King County*. *Seattle Historic Society was incorporated on January 8, 1914, with founding trustees being Judge George Donworth, Judge C. H. Hanford, Judge R. B. Albertson, Lawrence J. Colman, University of Washington Professor Edmond S. Meany, and Margaret Lenora Denny. These members and many other Seattleites worked hard for the next fifty years to open a museum that would tell the history of their city. These efforts led to Seattle's Museum of History and Industry (MOHAI), which opened on February 15, 1952 in Seattle's Montlake neighborhood. 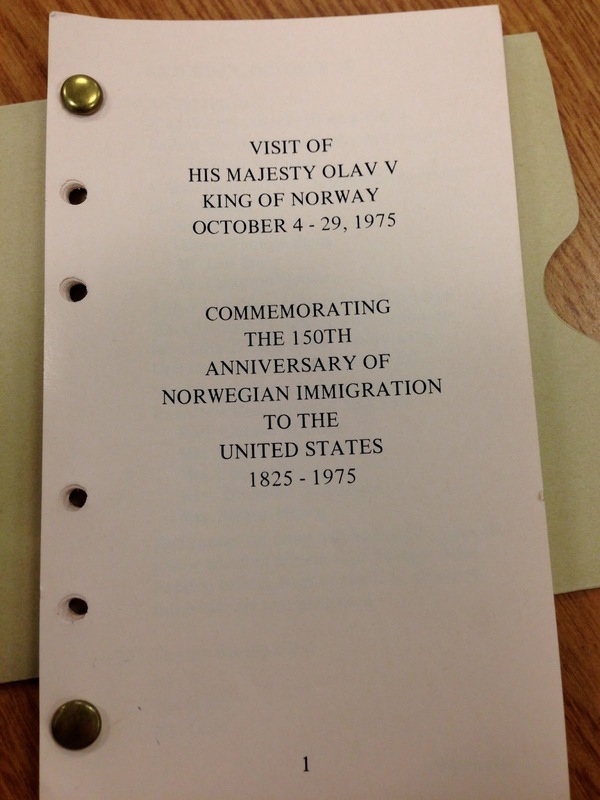 A file folder of the planning documents for MOHAI's 1975 exhibit titled "Norwegian Immigrant Exhibit of Puget Sound and Alaska". 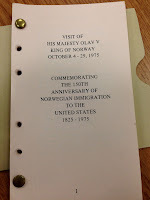 A file folder of documents pertaining to the Visit of His Majesty Olav King of Norway October 4 - 29, 1975, which commemorated the 150th Anniversary of Norwegian Immigration to the United States, 1825 - 1975. An archival box titled Ephemera Collection: Norwegian-American that we all will want to spend more time with. Two archival boxes of Anders Beer Wilse Photographs. An archival box of Carl H. Moen Photographs: modern prints and cassette tapes. Ms. Marr answered our flood of questions, then gave us a behind-the-scenes tour of the library stacks. She showed us how best to access the over 100 finding aids that are available online, and coached us on 'suggested verbiage' to use when seeking an appointment to visit this magnificent library for research. Nearly three hours later, we were on our way, with a better appreciation for how to access this resource library and its contents. It was well worth the trip to Georgetown, and we will definitely be returning to the library for research visits. 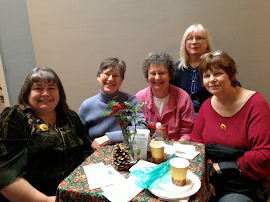 We extend our gratitude to Carolyn Marr, librarian, and also to Lorraine McConaghy, MOHAI's public historian, who has been an important role model for nearby historians like us. You can explore many of these items through the library's digitized photo archive and online research collections. Additional items can be viewed at the library, located at the MOHAI Resource Center (5933 6th Ave S, Seattle, WA 98108). The library is open to the public by appointment from 1-4 pm Tuesday, Wednesday and Friday. To make an appointment email library@seattlehistory.org or phone 206-324-1126 ext. 137 or ext. 138.